I do it about every third time I make homemade yogurt. I get impatient, turn the stove burner up too high, and burn a nice layer of black milk on the bottom of the pot. Luckily it’s an easy fix. 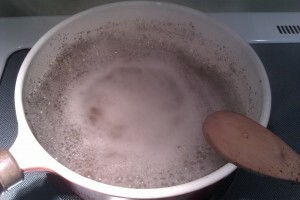 Just put a bit of water and baking soda in the pot, place it back on the stove and boil it. The burnt milk lifts off in specs, or you can hasten the process by scrubbing a bit with a wooden spoon. When the pot cools, you can wash the pot with soap and water as usual. It’s a good idea to put water into the pot (1/4) and then plenty of salt and leave it for 2-3 hours. Now, you can clean the pot easily. Hello! You have to be patient with milk LOL I’va also burned my milk but I had to trow it away… and I never tried again… Now I think I will be try your tip! This was amazing. I made home made yogurt and found my pan had scorched milk on th pan bottom. I tried other web site’s solution but no luck. Thank you for your suggestion…worked great!!!! Perfect recommendation! Really appreciate it! Thought I ruined my pan! Thank you so much! You have literally saved me from facing the incomparable wrath of an angry mother who’s discovered a ruined pot! These toys are very different from the normal or usual toys given to child for playing. that in most of the cases you would be allowed to download only a trial version or even if it is a full version, it would be available for a limited time period only. Look out for the riders and be aware of all the regulations in the website. Easy way to clean burnt vessels for lazy asses like me!! Haha thank you for the perfect tips. I always have problem when I try to do something with milk. Hope I won’t ruin it the next time. WOW! Great tip! This is the one I look for, very useful. Thank you, Kat! Just trying your method with Baking Powder because I font have Baking soda. Do you think that will work? It worked perfectly! Thanks so much. This has always been a serious problem for me and I had no idea that it can be solved so easily. Thank you so much for this helpful post! Arrrr, thank you for this post, i had many difficulties cleaning my pots! It’s been really helpful what you wrote! The Hoover comes with best features like powerful Hand Tool for precision cleaning, a rinsable filter, a HEPA filter, and on-board tools. Click here to get the complete information about Hoover uh70120 vaccum. I burned a milk/sugar mixture in my pan. Tried both the salt and the baking soda methods. Perhaps because of the sugar, neither method worked, but wine boiled in the pan took it right off. It occurred to me to try wine, because it is used to deglaze pans – essentially removing burned on sugar. Thank you so, so much for this great tip! !